Cannon Ball, ND – Over the Labor Day weekend, while many people were celebrating and preparing for the upcoming school-year, Dakota Access, a subsidiary of Energy Transfer Crude Oil, began bulldozing American Indian burial sites. As protesters attempted to intervene in the desecration of ancestral land, private security guards used attack dogs and pepper spray, injuring dozens of people, including children. Although the burial and ceremonial sites were identified by experts only a few days earlier, in order to stop construction on these sites, the State Historic Preservation Office (SHPO) needed to officially survey the area. However, before they were able to undertake a survey, Dakota Access intentionally plowed through the land, destroying unknown numbers of graves and artifacts. Activists on the ground reported construction workers deliberately dozed the site before SHPO had an opportunity to survey it. 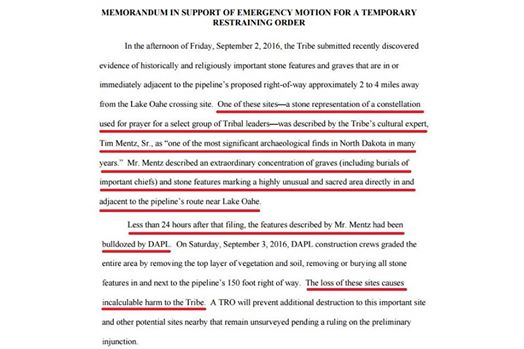 The tribe attempted to get a temporary restraining order to prevent the destruction of a major ancestral heritage site, including burials and cultural items located on the west side of Lake Oahe, but Judge Boasberg, who also sits on the Foreign Intelligence Surveillance Court (FISA), refused to grant the order. The Standing Rock Sioux are up against some of the most powerful financial and corporate interests on Wall Street, the profit-driven institutions that are bankrolling this pipeline plan and so many others like it throughout the country. Perhaps the participation of so many major financial institutions in this project is why you have heard absolutely nothing about the Dakota Access Pipeline from presidential candidate Hillary Clinton, who has in the past extolled her support for American Indians — but has remained deafeningly silent on this issue as the protests have grown. Well, this past weekend, on September 3rd, Labor Day weekend, the Dakota Access pipeline company attacked Native Americans with dogs and pepper spray as they resisted the construction of the $3.8 billion pipeline on a sacred tribal burial site. Also, Saturday was the first day of a two-week call for actions against the financial institutions that are bankrolling the Dakota Access pipeline project. A new investigation has revealed more than two dozen major banks and financial institutions are helping finance the DAPL, the Dakota Access pipeline. The investigation was published by the research outlet LittleSis. It details how Bank of America, HSBC, UBS, Goldman Sachs, Wells Fargo, JPMorgan Chase and other financial institutions have, combined, extended a $3.75 billion credit line to Energy Transfer Partners, the parent company of Dakota Access. Powerful oil and gas companies are taking drastic steps to override the tribe’s objections, using their immense financial resources to line the pockets of politicians in a push to build this pipeline, which will serve to further pad the industry’s bottom line. However, behind the companies building the pipeline are a set of even more powerful Wall Street interests that reveal a who’s who of the 2008 financial crisis. Energy Transfer Partners has a revolving credit line of $3.75 billion toward expanding its oil and gas infrastructure holdings, with commitments from 26 banks. Sunoco Logistics has a credit line with $2.5 billion in commitments from 24 banks. Energy Transfer Equity has a credit line with another $1.5 billion in commitments from most of the same big international banks. That equates to $10.25 billion in loans and credit from 38 banks directly supporting the companies building the pipeline. These mega-banks have an expectation of being paid back over the coming decades as a return on their investment. The problem with this scenario is that by locking in widespread drilling and fracking in the name of U.S. energy independence/security, banks are increasing the dependence on fossil fuels. With so many new clean technologies coming online, the idea of being beholden to the dinosaurs of energy — coal and oil — seems antithetical to modernization and efficiency. 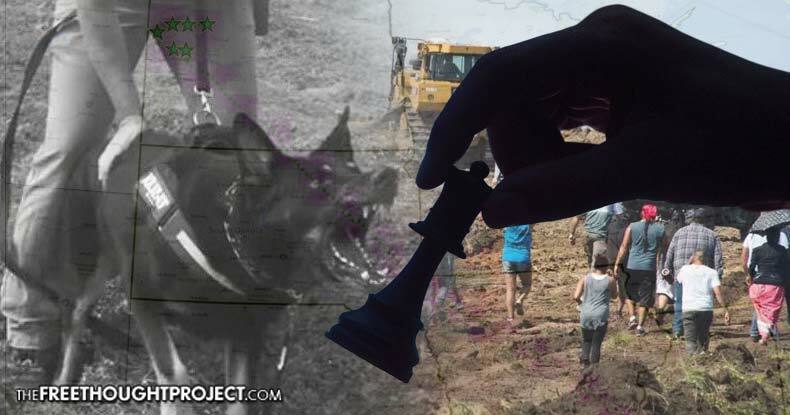 One thing to keep in mind is that the people financing the bulldozers, the dogs, and the tear gas have only one goal – to protect corporate interests and make more money, which can be then used to gain more influence; a seemingly never-ending feedback loop of greed and power. The corporate oligarchy is obviously working diligently to enrich itself at any cost.